Our Beautification Committee is hard at work! 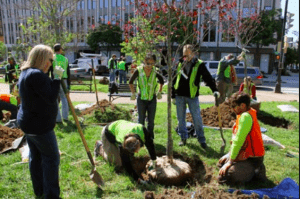 They secured a Keep Indianapolis Beautiful grant to planting 25 trees along the College Avenue median just North and South of the 67th Street bridge. We need lots of volunteers from 9am-noon. Meet We will have donuts, coffee & bagels courtesy of Hubbard & Cravens and Einstein Bagels. Trees matter! More than just good looks, the trees we plant support life. They make a healthier, cleaner, and greener home for people and nature. How do trees do it? They capture stormwater, helping prevent raw sewage from overflowing into our waterways. These trees remove thousands of pounds of pollutants from our air and soil. Thousands of species of birds, butterflies, and insects use the trees we plant for food and shelter. Trees reduce extreme summer temperatures, lower utility bills, and increase home values. Research also shows that trees help to reduce crime and foster more sociable neighborhoods. In urban neighborhoods, the greener the street, the calmer the traffic and the lower the crime rate.